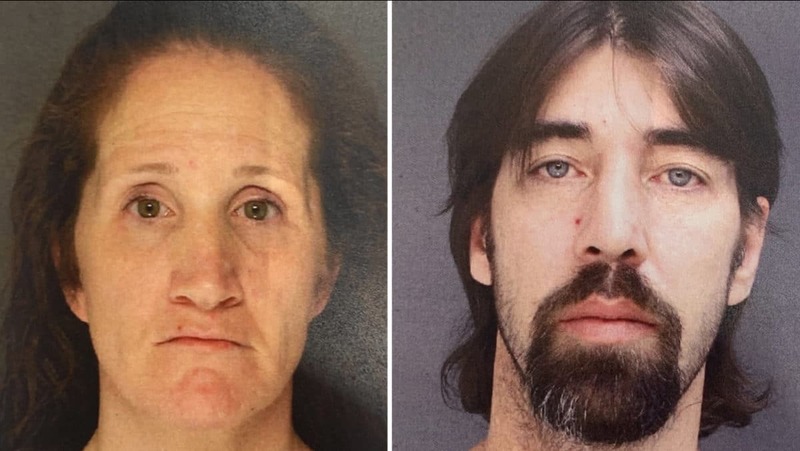 Nora Boyle and Greg Searl, Upper Darby, Pennsylvania parents arrested after their 16 month old toddler nearly dies after ingesting on empty opioid baggies. The parents of a toddler who almost died after eating heroin have surrendered to Pennsylvania authorities, according to the Upper Darby Police Department. Nora Boyle, 35 and Greg Searl, 42, surrendered to police early Wednesday morning. Both were charged with endangering the welfare of a child and related offenses according to a statement by police. Upper Darby Police Superintendent Michael Chitwood says the 16-month-old boy ingested heroin and possibly fentanyl. He says the boy is still alive because of Narcan. ‘That child was lucky enough to get to the hospital, being taken by the drug addict father and mother, to where the doctor shot him up with Narcan,’ said Chitwood during a press corps meeting 6ABC reported. Police say Boyle was watching her son on the 700 block of West Chester Pike, when she reportedly passed out. That’s when the little boy chewed empty baggies with drug residue. Greg Searl admits shooting up five bags of fentanyl the night before. Searl came home from work Monday evening to find Boyle and their toddler son laying on the bed- passed out- surrounded by more than a dozen empty drug packets. ‘The father notices that the baby had chewed on some baggies — plastic bags — of the type used to package heroin and/or fentanyl,’ Chitwood said. The boy’s life was saved when the parents raced to hospital where their son was treated with Narcan. According to police, Searl admitted the night before shooting up five bags of fentanyl. ‘No question the baby ingested some type of residue from the packages. There’s no question,’ Chitwood said. ‘We do a search warrant of the location and we find a total of 12 empty packages and bags’. Not immediately understood is how the parents were so readily able to acquire the opioid and whether authorities ought to have been aware of their ongoing addiction and the inherent danger that brought to their child.